Shop4Teams is your online go to superstore for youth warm up jackets and warm up pants in a variety of colors and styles. We offer teams discounted prices and the friendliest customer service around. With games in all types of weather coaches and players need warmup jackets to protect them from the elements and keep their players’ muscles limber. 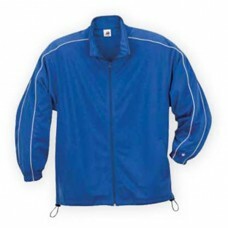 We carry warm up jackets in polyester, fleece, nylon, satin, and many more technologically advanced materials. We also carry a wide variety of warm up suits. These are matching warm up track pants and matching warm up jackets. Our warm up jackets come in so many colors combinations we are sure to have what team needs. Since we carry brands you know and trust, you can be assured that your team warmup jackets will be of the highest quality and at the guaranteed lowest price. Size chart Micron™ polyester is a lightweight, wind/water-resistant fabricSleeves and arms are.. Size chart Micron™ polyester shell is lightweight, wind/water-resistant, and quiet for comfortable m.. Size chart Micron™ polyester shell is lightweight, wind/water resistant, and quiet for comfortable m.. Size chart . Micron™ Poly Shell, modern and quiet, micro-denier polyester . Wind and water-resistant.. Size chart Micron™ polyester is a lightweight, wind/water resistant fabric Embossed Micron .. Size chart Micron™ polyester is a lightweight, wind/water-resistant fabric Sleeves and arms.. Size chart Swif-Tec™ double-weave technology features a lightweight, textured polyester surface and .. Size chart Micron Polyester is a lightweight, wind/water-resistant fabric Sleeves and arms .. Size chart Lightweight, Soft Shell outer fabric in 96% Polyester/4% Spandex bonded to 100.. Size chart . Rigor nylon shell, versatile and lightweight . Wind and water resistant . Ash heather s.. Size chart Flex-Sof™ is a smooth, lightweight, polyester knit with superior abrasion-resistance, hig.. Size chart . Made of ultra-lightweight Aero-tec fabric provides both weather protection and zer.. Size chart . Micro-Cord shell fabric has a textured dobby polyester surface and medium weight t.. Size chart . Micron polyester shell is lightweight, wind/water-resistant, and quiet for comfort.. Size chart . Tricotex Shell, 10.5 oz. polyester tricot knit . Tri-color design with inserts and.. Size chart . Micron poly shell is lightweight, wind/water resistant, and quiet for comfortable movem.. Size chart . Micron polyester shell is lightweight, wind/water resistant, and quiet for comfort..